Today is Thanksgiving and it’s appropriate to share a few brief facts about turkeys. After all, they are the centerpiece of so many American dinner tables today. Our specialty is eye care, so we naturally asked ourselves the question, “How well can turkeys see? We did our research and here’s what we found out about a turkey’s vision as well as some other interesting facts about these birds. Note, the below relates specifically to wild turkeys, not their domestic cousins, who are actually the ones that the majority of us will roast in our ovens. Wild turkeys are native to the forests of North America and are the only breed of poultry indigenous to the Western Hemisphere. Turkeys live in a wide variety of habitat but are most commonly found in hardwood forests with grassy areas. 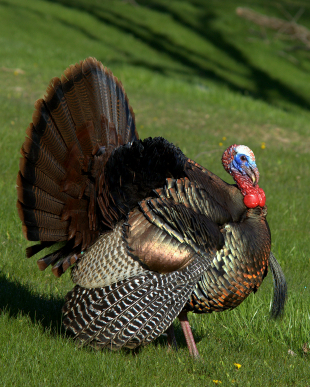 An adult wild turkey has approximately 5,500 feathers and weighs between 10-20 pounds on average. Their lifespan usually ranges from 3-5 years. Wild turkeys were first domesticated in Mexico. Spanish explorers returned to Europe with turkeys from North America as early as 1519. Wild turkeys were on the verge of joining the dinosaurs. In the 1930’s, habitat destruction and overhunting had placed this bird on the brink of extinction. However, do to the efforts of environmentalists and hunters alike, the wild turkey has made a remarkable comeback. Today, wild turkey numbers have swelled to over 7 million. Wild turkeys have excellent vision during daylight hours. Turkeys see color and have a very wide field of vision. In general, their eyesight is about three times better than a human’s. As any experienced turkey hunter knows, particular attention must be paid to what a person wears on a turkey hunt. Camouflage attire needs to match the surrounding terrain very closely. Otherwise, the turkeys can distinguish a hunter’s slightest movement very easily from over 100 yards away. When turkeys see danger, they can flee rather quickly. A wild turkey can run at speeds of 25 mph and fly short distances at 55 mph. For my own part I wish the Eagle had not been chosen the representative of our country. He is a bird of bad moral character…. The Turkey is in comparison a much more respectable bird, and withal a true original native of America. He is besides, though a little vain & silly, a bird of courage, and would not hesitate to attack a grenadier of the British Guards who should presume to invade his farm yard with a red coat on. Thanksgiving is a time to pause and give thanks for all the precious things in life including healthy and clear vision. Shawnee Optical wishes you and your family a Peaceful and Happy Thanksgiving! To learn more about quality eye care and eye wear (for humans, not turkeys), please visit http://www.shawneeoptical.com.